The goal of this project was to investigate and explore a transition space utilizing various research methods in an effort to better understand how these research methods assist in the gathering of data and the formation of ideas, theories, conclusions, and artifacts. The project was divided into two parts spanning six weeks. The first part entailed research methods that were logistic in practice while the second part utilized methods that were more ethnographic in nature. In carrying out these research methods, we attempted to extract valuable findings and construct conclusive statements regarding the transition space of interest. Prior to any form of research taking place, we first set out to determine the transition space of interest for our project. This was completed using open brainstorming between team members where everyone was encouraged to share any ideas for interesting spaces where any sort of transition takes place. Once we had compiled a list of 36 different transition spaces, we narrowed down our list to three ideas based on accessibility of the space and depth of interest based on the expected transitions that occur in the space. 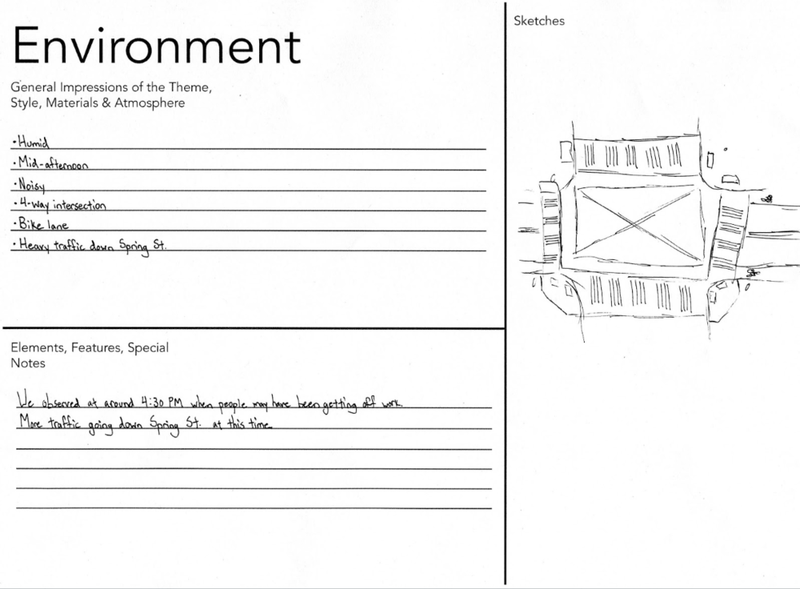 From there, the team held an open discussion about the three ideas to come to a consensus on a single space to investigate as the subject of the project. Through this discussion, our team decided on the transition space of crosswalks, largely inspired by the crosswalk located at the intersection of Spring Street and 5th Street in Atlanta. We decided on this subject because of the fact that the intersection was easily accessible to all team members and that the transition that occurred at the crosswalk was multi-directional and moderated by external factors such as the traffic lights and the legal framework regarding crosswalk activity. We began our investigative activities on the crosswalk using three different research methods that fit within the logistic approach towards research. The logistic approach is characterized by the deconstruction of the subject of research into its fundamental components and the subsequent construction of conclusions regarding the research subject based off of the identified components. The research methods that we carried out in this part of the project all carry out this process of deconstruction and construction in some capacity both individually and in conjunction with one another. In our initial data gathering efforts, we headed out to the intersection of Spring Street and 5th Street and conducted general observations of the environment, the users of the crosswalk, and the actions that occurred in the space. We then placed our observations in the AEIOU framework to extract initial findings. The AEIOU framework sorts observation data into categories of Activities, Environment, Interactions, Objects, and Users. Activities – Activities covers the actions that users take within the environment to complete their desired goals. For the crosswalk, this included actions such as walking, running, watching the cars, reading the traffic lights, etc. All of these actions were completed in service of the general goal of crossing the crosswalk. Environment – Environment encompasses any general notes about the atmosphere of the space where the observations took place. When we observed the crosswalk, we made note of the time of day, the weather and temperature at that time, and the level of noise and traffic at the crosswalk. Objects – Objects lists out the items within the environment and observes how they’re used in relation to their activities. Some objects of note for us at the crosswalk were the presence of a crossing button on some corners, the abundance of visual stimuli by traffic lights and signs, and how people kept their hands busy with bags or their phone or other objects. Users - Finally, Users provides a list of people observed in this space going through these activities. Here we looked at behaviors in relation to their actors and noted how that behavior might reflect on their roles or preferences or expectations. Behavioral map of activities at the intersection of Spring Street and 5th Street in Atlanta, GA. When we conducted our observations of the crosswalk, we also made special note of the placement and movement of participants within the transition space for use in place-based behavioral mapping. This method illustrates the behaviors that occur within a location of interest using coded graphics such as symbols and numbers. The map that we created from our observations show how pedestrians utilized the unique diagonal crossing that occurs at this intersection as well as the density of participants, both pedestrian and drivers, that accumulates at the intersection. Our experience researching interactions using logistic research methods showed us that they were very useful in gathering reproducible, quantitative data but gathering qualitative data or data that spoke to the more subjective experiences within the crosswalk was much more difficult. In other words, through these methods we could know how long it took on average for people to cross the crosswalk but we could only hypothesize as to why someone was rushing through the crosswalk. Another way that this manifested was in our creation of personas. Through the personas, we attempted to use objective data of what had occurred in the crosswalk during our observations to understand who the users of the crosswalk are, but ultimately it resulted in the problematic categorization of people under harmful stereotypes. In part 2 of the project, we approached gathering data about the crosswalk as a space of transition utilizing ethnographic and operational research methods. Unlike the methods used in part 1 of the project, the purpose of these methods was not to gather objective and reproducible data about the crosswalk, but rather contextual and experiential information of how people interacted with the crosswalk. Using the method of directed storytelling, we gathered stories of peoples’ experiences interacting with the crosswalk at Spring Street and 5th Street. With directed storytelling, we reached out to people who had interacted with the crosswalk in some way and asked them to tell us a story of that interaction. With this method, we are looking at how users craft a narrative around their experience as well as the emotions they convey through their storytelling. As the participants would tell their stories, we would respond by asking probing questions to dig a little deeper and really get to the finer details of their experience. The Love Letter & Break-up Letter was another method we used to get at how people conceptualize their relationship with the subject of interest, in our case the crosswalk. Here we asked participants to write a love letter conveying what they appreciated about the crosswalk as well as a break-up letter describing what they despised about the crosswalk. We used participant observation to build a personal frame of reference in comparison to the data we gathered through the storytelling and letters. 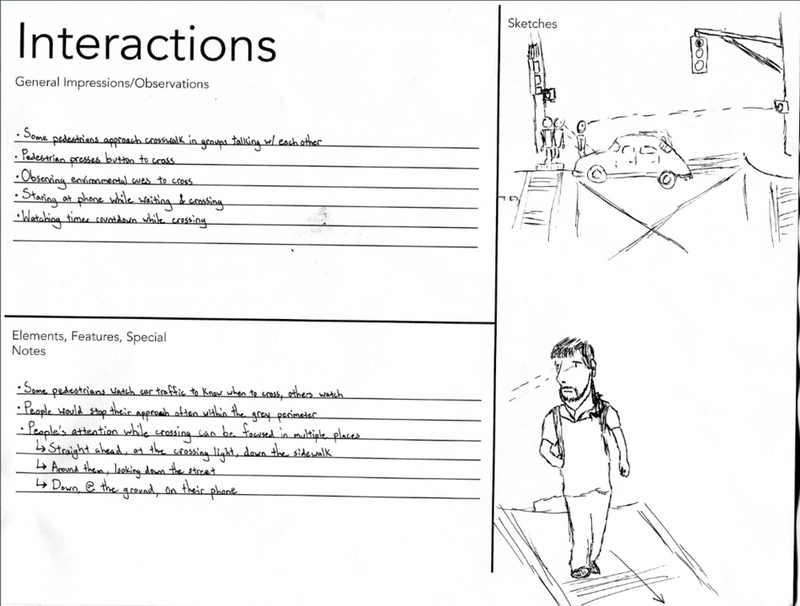 Participant observation entailed that we take detailed notes of our own experiences interacting with the crosswalk during the data collection period. These notes included information such as what day and time we crossed, what direction we were headed, what we were thinking of while crossing, and any other environmental information that may have seemed relevant to the experience. Given the rich amount of ethnographic data that we had gathered during this phase of the project, we wanted to create pieces that accurately captured and conveyed these themes within the experience of interacting with the crosswalk. 15. I go because I’m told. 14. I move because I can. 13. I’m here until I’m not. 12. I know where I must be. 11. I feel the gaze of the lumbering beasts. 10. I sense their urgent hunger. 9. I know where I must be. 8. I’m here until I’m not. 7. I go because I’m told. 6. I move because I can. “Dear crosswalk, I really don’t like anything about you, even from a pedestrian point of view. You’re pointless! There was never any trouble without you. Dear crosswalk, I love how I barely have to wait to cross you when I’m on foot. Everything moves so quickly. I get to you, glance at my phone for only a moment, and then suddenly I’m crossing you. I tried to turn at like 4pm, which wasn’t allowed, but I didn’t know and a cop yelled at me. And I was very confusing, and I didn’t know. I missed the sign and I was just trying to get to work because I was late for work and I just needed to get to my parking deck. If just miss the timing, I’ll wait longer. But like even then, it’s not that bad. And particularly for you, cuz like normally I’d have to wait like two cycles but now I can just cross diagonally. You used to be a really difficult intersection, particularly during rush hour and turns. It would be really dangerous because I would be crossing but like if people were crossing, I’d like have to back up or I’d end up with weird dangerous turns. “I noticed Sunday this sign is up, ‘Don’t get caught in the box.’ It wasn’t up Thursday. Now if you’re green, I know I can just turn. But I find that you’re not the good idea I thought you were, you’re just a shoddy quick-fix for a whole lot of hidden stupid. How will we know whether to cross the street, unless we’re told? I just don’t understand why you were created in the first place.